Every now and then I’ll spot someone riding a bike in the middle of the night and most of the time it’s almost impossible to see them. Part of the problem in my area of the world is that it’s usually on a very dark back road and the reflector is so small it’s easily mistaken as nothing more than a mailbox with a reflector on it. 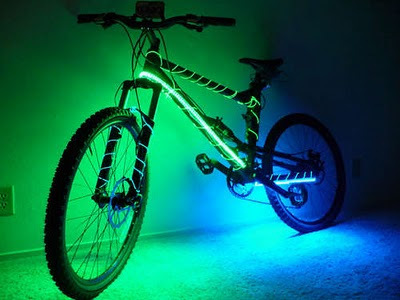 If you want to do a little something extra to make your bike stand out this is one tutorial you should check out. Before you do put these on your bike you might make sure that it’s not illegal. The whole thing is a 10 step process that might take you a little bit of time. In addition to that it’ll probably cost you around $130 for all of the necessary parts, at least that’s what it cost the person that did this particular bike. The guide is a little complex, so if you’re not experienced with wiring you may want to enlist some help. You can read up on the project by going here.